Menu Peru what is the deal? In the United States we are accustomed to ordering our food off of the menu, be it at a drive thru or a fancy sit down restaurant. In Peru, Menu has an entirely different meaning. You will see the word Menu mostly on billboards sitting out in front of the local restaurants. In Peru, Menu means the specials of the day. Rather than choosing one item you order Menu and get a 2 course meal. The first Menu serving normally is a soup or sopa which is sometimes referred to as caldo or chupe depending on the ingredients. Popluar choices are caldo de gallina (chicken soup made with a hen), caldo de camote (sweetpotatoe), Chupe de mariscos (seafood like muscles or clam), Chupe de pescado (white fish) or my most favorite Chupe de langostinos (a spicy shrimp soup). Most often you will have a choice other than soup such as papa huancaina which is one of the most popular around the country. Papa huancaina is made of skinned and sliced boiled potatoes topped with the Peruvian favorite, a spicy sauce, made from aji amarillo or orange peppers and queso de casa which is fresh white cheese and saltine crackers blended together with milk. The second dish is dependent on what was fresh in the market that day. Items range from cebiche with chicharrone de calamar also known as fried calamari, lomo saltado (a spiced steak and pepper mix served over fried potatoes and rice just to name a few. 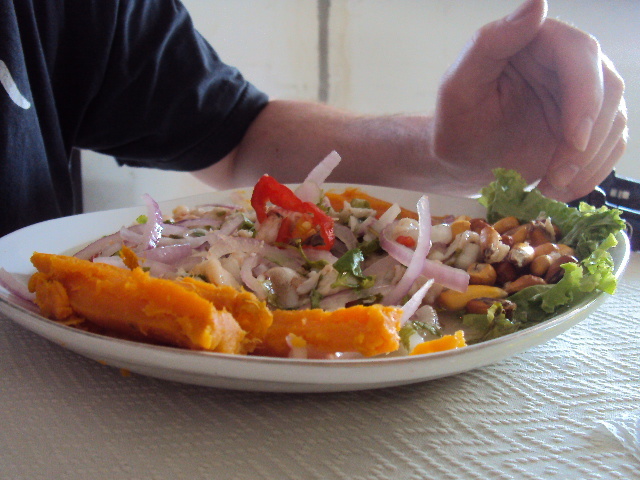 The second dish will vary widely depending on which area of Peru that you are visiting. In addition to the two courses you will sometimes be served a refresco which is some sort of drink as well. Refresco can range from a sweetend tea to maracuya passion fruit drink. To sum up the meaning of Menu in Peru it basically means that you are going to get a full meal and sometimes a beverage as well. There is usually a set price listed on the billboard which will let you know the price for the meal. In Lima and in Cusco I normally pay between 4 and 7 soles for Menu when eating in the markets, but places outside of the markets can be much more costly. In Mancora Menu can be as pricey as s./ 12 soles on the avenida grau. My all time favorite place to get Menu is the Cristo Rey Cebicheria which is close to where I stay in Rimac not far from the Plaza de Armas where prices are normaly 6 or 7 soles depending on how big a portion you decide on. Remember the Menu and one thing is for certain you will not go hungary while visiting Peru. Bon Appetite! On my recent vacation to Mancora Peru we decided to eat at a little place on the main street running through town call Restaurant Mechita. We found the place while we were looking for a place to get Menu for cheap. We noticed that they had Menu advertised out front on the billboard for s./8 soles so we decided to give it a try. The menu lists various marisco’s seafood and criolla fare and the prices are about half what you will pay at the Espada, which I did not visit after reading several bad reviews. We ordered chicharrones de calamar which is fried calamari for our girls for s./8 soles. The menu came with a starter of papas huancaina which was decent although it is pretty hard to screw up skined boiled potatoes in huancaina sauce, it was good though as I tried a taste. The chicharrone de calamar was very fresh and cooked to perfection. I was in the mood for some fresh shrimp and decided to try their cebiche de langostinos which is priced at s./15 soles or about $5 usd. The cebiche de langostinos was absolutely superb! The shrimp were fresh and plentiful as I did not expect to get so many shrimp for that price. The leche de tigre was perfectly spiced with ricotta pepper and red onions combined with key limes. The dish was served with a piece of choclo corn and camote sweet potatoes on the side. The restaurant has outdoor seating on the front patio and ample room inside. They were showing the world cup game inside which is where we were seated. If you are going to try to get Menu on avenida grau rather than the boardwalk this is a good choice. I give Restaurant Mechita (***) 3 stars for a delicious quick lunch. I ran out of corn tortillas soon into this trip down to Peru. I had not been able to find any tortillas or taco sauce my entire first trip, which lasted for 4 weeks. This trip I was nearing 6 weeks when I stumbled upon a gold mine of Bimbo Tortillas while grocery shopping at the new Plaza Vea on Avenida Wilson. The Tortillas were near the bottom shelf of the american style sliced bread isle at the edge of the store. After walking around I also found a rack of them at the cheese counter. It was a relief to find them as I have been craving some real authentic Mexican for the last few weeks. 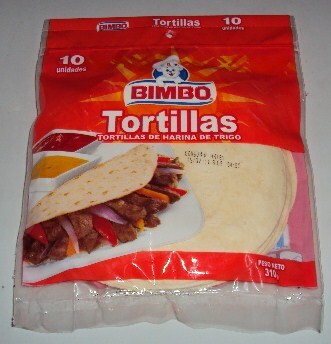 A package of 10 Bimbo Tortillas was priced at s./5 soles, but I would have paid more if I had to. I have searched 3 different Metro supermarkets in Lima center and Rimac as well as the new super Tottus on avenida Tacna and have yet to find anything resembling Mexican Taco sauce or taco seasoning. Monday will be taco night complete with ground beef and some steak fajitas too. What a relief, VIVA La Mexico! The Restaurant Tumi is located on the boardwalk connecting the Pahamerican Highway to Mancora Beach on your righthand side. I chose this place because they were advertising Menu for s./ 8 soles. Tumi is an open air place with plenty of seating. The seafood was fresh and the beer was super cold. Menu ranges from fresh fish, chicharon de pescado, chicharon de langostinos, lomo saltado and assorted other dishes as they have quite a large Menu daily. The first serving of the day was a choice of fresh cebiche or paps huancaina. The huancaina sauces was great and I like it spicey! I ordered chicharon de langostinos while my family chose chicharon de pescado and lomo saltado. All the meals were good and served hot. I recommend it as a nice place to get out of the sun while enjoying a nice quick meal. I give the Restaurant Tumi in Mancora, Peru a rating of (***) 3 stars for budget travel dining. The Pizza Palace located in the Plaza de Armas is my favorite place to stop in for a quick bite and the Pizza is the best I have had in Peru. The ingredients are fresh and the pizza is great. The atmosphere is perfect for a stop on a date if you are enjoying a walk through the Plaza de Armas to see the fountains, touring a nearby museaum or shopping in the jiron de la union. Pay for a gaseosa y pizza personal (a slice) at the caja and grab your food and head to one of the many bar stools for seating. Cost for a soda and a slice of the best pizza in Peru is s./ 2.50 or about $.95 usd. I give the Pizza Palace a rating of (****) stars for the excellent pizza and budget friendly prices it is a must try when visiting the Plaza de Armas in Lima, Peru.